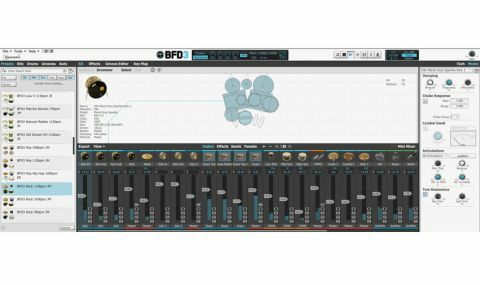 Setting a new standard in its field, BFD3 is the ultimate virtual acoustic drum system - we honestly couldn't be more impressed. Great-sounding kits. Realistic modeling of swells/resonance. Highly editable throughout. Excellent effects, dynamics and EQ. Brilliant editable performances. Rudiments in the Groove Editor. FXpansion's BFD has always been one of the finest options out there for realistic acoustic drum kit emulation - in fact, it was the first virtual instrument to even attempt to fully emulate all the depth and nuance of the real thing. In a nutshell, the latest version, BFD3 (VST/ AU/RTAS/AAX/standalone) comprises a collection of deeply configurable and virtually miked-up sampled drum kits, complete with mixer and a vast range of effects, as well as a built-in groove sequencer that ships with a ton of fully editable prefab patterns. "Installing BFD3 is a smooth and painless experience"
Installing BFD3 is a smooth and painless experience, and FXpansion's improved authorisation wizard searches out relevant content and logs in to your user account to check and activate all of your third-party and legacy BFD1 and 2 content within BFD3. Visually, the interface could hardly be more different to that of BFD2. It's leaner, more graphic than photographic, resizable horizontally (for large mixer setups), and - in our opinion - quite beautiful. The kit pieces (now called Drums) still include full colour mugshots, maintaining that 'kid in a candy store' vibe that's always been part of the BFD experience. Lots of things have been moved around in the GUI, though, so there's a brief adjustment period, but it's all very intuitive - more so than BFD2, certainly. The left-hand side of the GUI houses the (hideable) Browser, from where Presets, Kits, Drums and Grooves are loaded. BFD 3 introduces five new drum kits (118 Drums). Kits 1-4 comprise DW, Pork Pie/Tama, Ludwig and Gretsch drums with Zildjian and Paiste Cymbals, and were recorded at Ocean Way in LA through an arsenal of dream outboard, including Neve mic preamps, EQs and compressors, and EL8 Distressors. The fifth kit was recorded at Omega Studios, Maryland, and it's presented three times, played with sticks, brushes and mallets. All of the kits sound incredibly realistic and play beautifully via e-drums or pads. FXpansion's new proprietary lossless compression method crushes the 160GB (!) library of sampled drums and cymbals in the new kits down to around 50GB, taking up less drive space and improving loading times. As well as the drums themselves, the mixer takes centre stage in the GUI and is surprisingly flexible and powerful. Channels can be hidden and revealed in sets, including Direct mics, Ambient mics, Auxiliaries and Side Chain. As well as the full mixer, there's a separate Mini Mixer, which can be configured to show just a few crucial channels of your choosing. The inclusion of a 'sub' channel for certain kick drums is very cool, and the Preset mixer setups are far more punchy than BFD2 users will be used to, thanks in part to the new DCAM envelope shaper. The mixer's Tweaks view gives access to per- channel Trim, Tune and Damp controls, but the Drum Editor is where the real sound-editing action takes place. We look at its Model page in The Modelling editor, and the Tech page deals with levels, panning, tuning, mic bleed, dynamics and ambience. "An incredible amount of control is handed over to the those prepared to get their hands dirty"
An incredible amount of control is handed over to the those prepared to get their hands dirty. Assigning drums to your MIDI controller is done in the horizontal keymap overview, where the MIDI Learn Wizard makes connecting the various articulations of each Drum to keys/ pads a snap. Last but not least, each of the new kits comes with its own library of preset grooves, ranging from subtle jazz brushwork to full-tilt metal. These grooves are superb, as you'd expect, given that the drummers playing them include the legendary likes of Peter Erskine and Steve Ferrone; furthermore, the expansive Groove Editor makes the process of editing them intuitive and a lot of fun. The Roll tool from BFD2 has been upgraded to the Paint tool, which not only paints rolls into the sequencer but also a comprehensive library of other drum rudiments (divided up into Rolls, Diddles, Flams and Drags categories). Browsing these is an education in drum theory, thanks to the notes and musical notations that accompany them, and while non- drummers will need to handle them with care, of course, they make the technical side of drumming as accessible as it could ever be. There's much more to BFD3 than we have space to cover here - in terms of control and interface, it's the deepest virtual drum kit/ drummer on the market right now, throwing down a serious gauntlet for the likes of Toontrack, Native Instruments and Steven Slate Drums to pick up. One thing we'd still love to see built in, though, is a form of integrated audio triggering, so that we could use it as a drum replacement solution live and in the studio.